Rounding out July's reviews are: Erin Horáková, who finds Catherynne M. Valente's Deathless delightful on the micro level, but somewhat shapeless in the macro; Nathaniel Katz and Marie Velazquez, who take two looks at the first volume in Daniel Abraham's new epic fantasy series, The Dragon's Path, Nathaniel wondering when the payoff to the book's buildup will come, and Maria whether Abraham plans to complicate the somewhat simplistic treatment of race in the book; and Alvaro Zinos-Amaro, who looks at Times Three, an omnibus edition of three time travel novels by Robert Silverberg, with his usual care and erudition. Also, Strange Horizons is looking for volunteers to help us prepare for the website redesign by checking the existing content for errors. The details are here. After a couple of dry months, reading-wise, I've gotten back on the horse in a big way and with some very fine books. Here are my thoughts. Kraken by China Miéville - It's taken me a while to get to this book, and having finally read it the question foremost in my mind is: why? It's strange enough that Miéville is going back to the template of a Londoner who discovers that there's a magical underworld to the city, is forced into that world, and becomes proffiicient at navigating it and affecting it--a barrel whose bottom he had already rather thoroughly scraped with King Rat and Un Lun Dun, both of which were themselves heavily derivative of Neil Gaiman's Neverwhere, and which, in the intervening years, so many other writers have dipped their spoons into. But to write this sort of story as the follow-up to the breathtakingly original The City and The City, a book that seemed to herald a new stage in Miéville's already genre-changing career, is just baffling. 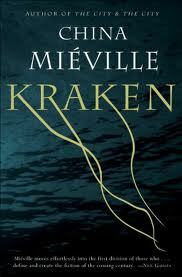 Kraken, in which natural history museum curator Billy Harrow is caught up in a magical arms race after the preserved body of a giant squid--revered by one of the city's many cults and thus imbued with great power--mysteriously disappears, is by no means a bad or unengaging book, and there are some nicely done and typically Miévillian touches such as a labor strike among animal familiars, or ghost policemen who are not actually the ghosts of real people but amalgams of copper clichés derived from reruns of The Sweeney and Life on Mars. But these are just touches--the structure of the novel, the personalities of its characters, and its take on London are all very familiar, from Miéville's previous work and from that of others writers. If it weren't for the fact that Embassytown seems to see Miéville returning to his form of having no form I'd be worried about where he plans to take his career. 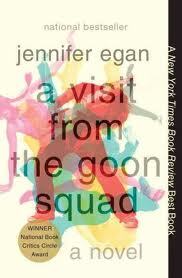 A Visit From the Goon Squad by Jennifer Egan - there are a lot of compliments I could pay Egan's already much-complimented novel, but I'll start with the glibbest one--that reading it feels like compensation for having suffered through Tom Rachman's The Imperfectionists earlier this year. Both novels are made up of connected stories that jump back and forth through time (though Egan's structure is more adventurous and demands more of the reader's attention) and which together form a single picture. But whereas Rachman, perhaps relying on the bittiness of his chosen format to obscure these flaws, wallowed in clichés and broad, unfunny attempts at humor, Egan's writing is deft and her characters are immediately believable and affecting. The stories span a period between the early 70s and the early 2020s, with characters appearing at different points in their lives, taking over the narrative thread after having previously played a supporting or walk-on role in someone else's story. For the first half of the novel, this seems like a clever and well-executed trick, but ultimately a self-defeating one, as it seems to prioritize a soap opera reading of the novel, in which what's important isn't the work as a whole but simply knowing how character X ends up. It was only very slowly that the brilliance of Egan's approach crept up on me, because of course what happens next, for all that it takes many forms, is ultimately the same--disappointment, disillusionment, and death. The goon of the title is time, and as the novel slips back and forth within it we watch debauched has-beens on their last legs turn into teenage wannabes quivering with rage and ambition, and promising children curdle into compromised adults. A picture of a long-dead friend becomes that friend on the day of their death, and a teenager convinced that she will never be as beautiful or successful as her friends becomes a contented adult puzzling over the ruin of their lives. If there's one flaw in the novel, it's in Egan's construction of the near future, which has the slightly hysterical tinge that we've come to associate with mainstream writers dipping their toes into SF--barely ten years in the future, America has been largely desertified, the music industry has overcome the digital crisis by marketing to babies, and everyone reads and writes text-speak fluently (OK, maybe that last one isn't so far-fetched). But the future chapters also help to drive home the fact that the goon-like nature of time isn't something that ever stops, and that the characters contemporary to us, who seem to have escaped time's ravages, are merely its next victims. Together with Egan's subtle prose and her generous treatment of her characters, this device gives a theme that might, in another author's hands, have seemed obvious and trite true resonance and heft, so that Goon Squad becomes genuinely heartbreaking. The Thousand Autumns of Jacob de Zoet by David Mitchell - Like Kraken, this book seems like an odd direction for its author to be going in, though in Mitchell's case I wonder if Thousand Autumns doesn't herald a more permanent shift. You can understand where Mitchell is coming from--alongside the praise that has been heaped on his novels, especially Cloud Atlas, there's always been an undertone of concern that maybe what's remarkable about these books, and about Mitchell as a writer, is their structure, the playful tricks with genre, voice, multiple points of view, and intersecting plotlines spread out over time and space (you could of course ask what's wrong with clever structures, and why they're considered less worthy--or a less integral part of the works that contain them--than plot or characters, but that's a broader discussion than we have space for). It's easy to imagine Mitchell deciding to write a more constrained, more traditional type of novel, but the result is, again like Kraken, good but also terribly familiar. Jacob de Zoet is a young clerk in the Dutch East India Company around the turn of the 19th century, who arrives in Dejima, an artificial island off the coast of Nagasaki which for several centuries was the only point of contact and trade between Europe and Japan. Thousand Autumns follows him as he engages in a campaign of reforming the corrupt trading station only to discover that his patron has his own hand in the till, then shifts to the points of view of several Japanese characters, then to that of an English captain who arrives in Nagasaki harbor hoping to take over the trading post. The novel's themes are familiar from Mitchell's other work--the universality of suffering and oppression, the horror of slavery, which powers the economies of nations and empires, and the mental contortions that slavers employ to justify it, the rare but very real instances in which a single decent individual can make a stand and make the world just the tiniest bit better--and there's a twist on this preoccupation when Mitchell points out that Japan has protected itself from Western colonization and exploitation by isolating itself, but that that same isolation is helping to preserve a restrictive, oppressive system of government. But that's not quite enough to set Thousand Autumns apart from so many other historical novels set in this period--it reminded me, in some portions, of Shogun, and in others of Sacred Hunger. 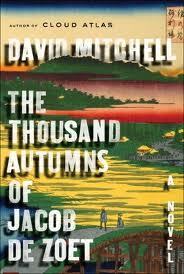 For all that it's well-written and has compelling, delicately-drawn characters and situations, Thousand Autumns can't help but stand in the shadow of these novels (and many others) even as it suffers from a comparison with Mitchell's more inventive treatment of its themes in his previous novels. The one point at which the familiar, unpredictable David Mitchell seems to rear his head is in the middle segment, when Thousand Autumns takes a strange turn towards the pulpy as one of the Japanese characters is kidnapped by a baby-killing immorality cult. This plot strand, however, not only sits poorly with the more naturalistic tone of the rest of the novel but is rather disturbing in the way it plays into the Western characters' conception of Japan as a society ruled by superstition and cruelty. Still, it's a welcome reminder that Mitchell doesn't really do conventional, and a promising sign that in his future work he'll strike a more distinctive tone. God's War by Kameron Hurley- Niall Harrison has been furiously evangelizing for this book, calling it one of the best books he's read in 2011. I wouldn't go quite that far, but God's War is certainly very good. Set on the planet Umayma which has for centuries been ravaged by religious conflicts, the story follows Nyx, a nihilistic, amoral bounty hunter, and her team of misfits and outcasts, as they try to keep their heads above water. When Nyx accepts a commission to track down a renegade alien scientist who may be planning to sell weapons technology to the other side in the war, she and her team end up in the crossfires of several powerful groups. If my praise of God's War is more qualified than Niall's, it's because this is a rather shopworn plot, and Hurley doesn't quite do enough to elevate either it or the novel's characters above the familiar beats of this story. The action scenes are good, but not exceptional. The characters are appropriately cynical and hard-bitten, but don't quite leap off the page. The proto-romance between Nyx and her team-member Rhys, a defector from the other side of the war who views his adoptive nation--and his employer--with disdain for their sacrilegious, godless ways, is effective but at the same time a little too obviously manipulative. It should be noted that all of these elements improve as the novel progresses, giving the impression of an author who is growing more comfortable with her invented world and characters, so that I have hope that the forthcoming sequel, Infidel, will either transcend the template imposed by its plot and character types or use it well enough that its predictability ceases to matter. In God's War, however, Hurley is not quite there. What makes the novel worth reading--and its sequel worth anticipating--despite this flaw is Hurley's worldbuilding, which is complicated, shocking, and overwhelming, all within the confines of a relatively short novel. Umayma was settled by Muslims, or rather followers of some version of Islam several millennia removed from ours, which has developed and experienced schisms and splits after the planet's colonization. Similarly altered version of Christianity and Judaism also exist on the planet, and humans on other worlds practice subtly different versions of these religions. Though religious conflict is at the root of many of Umayma's wars, it intersects with issues of gender (Rhys's nation is patriarchal while Nyx's is matriarcahl, and the war between them is in part over gender supremacy, but both countries send men to the front, either because they are prized or disdained), race (as well as prejudice over skin tone and an at best grudging tolerance of half-breeds, Umayma plays host to several genetic mutations, some of which confer prestige while others are reviled), and the struggle for supremacy between religious and political power. Hurley does a fantastic job of creating societies that are civilized and permissive in one respect, barbaric and oppressive in others, but more than that, she creates a world in which prejudice and sectarian violence of one form or another are, in the end, inescapable, and shows us how people learn to live on it simply because they have no other choice. On top of which are the alien aspects of Umayma--the centuries of terraforming that have resulted in a barely livable desert, the native viruses first tamed and then weaponized by the settlers, the abilities, such as shapeshifting, healing powers, and control over insects, that emerge within humans as a response to the alien environment, and the semi-organic, blood- and insect-based technology that arises as a response to all of these forces. God's War is a novel of blood and sand, and Hurley makes us feel both--the oppressive heat, the buzz of insects, the stench of a war zone, a boxing ring, or a magician's laboratory. It's an impressive achievement that more than makes up for the shortcomings of the novel's plot and characters, and leaves me eager for its sequel. The Long Ships by Frans G. Bengtsson - My immediate reaction when I started reading The Long Ships, originally published in Swedish in two parts in 1941 and 1945, and translated into English in 1955, was that Bengtsson was the Swedish Tolkien. Like Tolkien, he was an academic who nurtured a fascination with his nation's history and with pre-modern literary forms, and who translated that fascination--at the same time as the rest of the literary world was plumbing the depths of the modern, character- and affect-oriented novel--into a pastiche of those forms, a sort of rediscovered epic. For all my love of The Lord of the Rings, there's no denying that this sort of endeavor should give a prospective reader pause--will it be full of inhumanly heroic characters achieving impossibly great feats while declaiming long speeches? It wasn't long, however, before The Long Ships allayed these concerns, and not long after that I was completely under its spell. Though the Tolkien comparison holds water, a more relevant point of reference might be Michael Chabon, who in his introduction to NYRB Classics's reprint of The Long Ships proclaims himself a longtime admirer of the novel, and whose own Gentlemen of the Road was clearly influenced by it. Like Gentlemen and Chabon's other novels, The Long Ships is characterized by an infectious sense of whimsy, and the ability to mingle earnestly told swashbuckling adventure with just a hint of ironic distance. The Long Ships tells the story of Red Orm, a tenth century Dane who is kidnapped and press-ganged by Vikings, as he journeys to Muslim Spain and Christian Ireland, makes his fortune, wins the heart of a chieftain's daughter, and retrieves a buried treasure originally belonging to the Caliph of Constantinople. It's a rollicking adventure, but it is also often funny and bawdy. Far from being larger than life, Orm is an impossibly winning combination of boldness and bloodlust and endearingly human characteristics such a tendency for sarcasm and hypochondria. Other characters, such as Orm's best friend and would-be poet Toke, his headstrong wife Ylva, and the ill-tempered but ultimately kindhearted priest Willibald, are similarly engaging. An important theme in the story is the spread of Christianity throughout Scandinavia, and the novel's treatment of the strained relationship between pagans and Christians (and between Christians and Muslims, and Jews and everyone) is both funny and intelligent, showing the sometimes underhand tactics that Christian missionaries use to gain hold of pagans, and the way that pagans twist Christianity to suit their understanding of what a religion should be (a theme that is also touched on in The Thousand Autumns of Jacob de Zoet). Nevertheless, the heart of the novel isn't in historical recreation or comparative theology, but in adventure, and this it delivers so consistently and so well that it was almost sad to turn the last page and realize that there will be no more adventures of Red Orm. Eclipse 4, edited by Jonathan Strahan - I've read three of the four Eclipse anthologies, and, as Strahan himself notes in the introduction to this volume, each of them clearly had its own flavor. Eclipse 2 veered toward meat and potatoes SF. Eclipse 3 was literary. Volume 4 goes beyond that into what I'd call slipstream (for the purposes of this post, my rigorous definition of slipstream is "what I point to when I say slipstream"), with stories often aiming for that sense of Feeling Very Strange. But no matter what the theme of the anthology, Strahan and I can't quite seem to get along. I did better with Eclipse 4 than the previous volumes, in that there are several stories I liked and only one (Damien Broderick's "The Beancounter's Cat") that I disliked, but the general level of the Eclipse anthologies continues to disappoint me, to the extent that it's obvious that Strahan and I just don't have the same taste. The only story in Eclipse 4 that truly excited me was Gwyneth Jones's "The Vicar of Mars," which is set in her Aleutian universe but nevertheless works as a sly inversion of a very familiar type of horror story often employed by the imitators of Lovecraft. The vicar of a the title is an alien who arrives on Mars for a position that he views as semi-retirement, and encounters a deranged woman who may be haunted, and who passes that haunting on to him, thus challenging the very foundation of his beliefs. Jones gives this familiar plot a massively entertaining twist, and besides that does a good job of writing Mars as a place simultaneously lifeless and haunted, and of rooting the story in the Aleutian universe without drowning it in extraneous detail. Other standout pieces include Caitlin R. Kiernan's "Tidal Forces," in which a woman struggles to deal with her lover's inexplicable affliction, Nalo Hopkinson's "Old Habits," in which people who died at a mall spend eternity in it alternately reliving the moment of their death and craving sensation, Rachel Swirsky's "Fields of Gold," in which a recently-deceased man must face up to his failures in life in a party attended by his dead relatives, and James Patrick Kelly's "Tourists," the continuation of the adventures of space-brat Mariska (recently seen in the Hugo-nominated "Plus or Minus"). None of these, however, blew me away, and the rest of the anthology is solid but not much more. I'll probably keep reading the Eclipse anthologies, because there's usually at least one story in them that I love and because no one else in the field is doing what Strahan is doing, providing a high-profile venue for unthemed stories (or at least, they're not doing it as consistently--as Strahan notes in his introduction, the year Eclipse came out there were several other similar anthologies, such as Fast Forward and The Del Rey Book of Science Fiction and Fantasy, but none have developed into the kind of series that Eclipse has), but I think it's time to lower my expectations of them. We have two new reviewers this week. 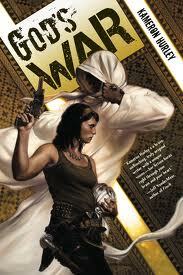 First, Lila Garrott looks at Betrayer, the latest installment in C.J. Cherryh's long-running series, and concludes that though it might lay the seeds for interesting stories later on, as a work in its own right it is a disappointment. In today's review, Guria King is more pleased by Kate Griffin's The Neon Court, the third Matthew Swift novel, which, though it disappoints Guria in its handling of its main character, pleases her in its interpretation of the term "urban fantasy." Between the two debuts, Niall Alexander reviews Kaaron Warren's third novel Mistification, a story about and containing stories which Niall finds somewhat less than the sum of its parts--the individual stories are engaging, but the story framing them is less so. Paul Graham Raven kicks off this week's reviews with a long, thoughtful look at Gwyneth Jones's collection The Universe of Things, which not only makes the collection seem like essential reading, but doubles as a detailed examination of the themes of Jones's writing. Raz Greenberg is less pleased with another collection, Stephen King's Full Dark, No Stars, whose four novellas Raz finds disappointingly uninterested in delving very deep into the psyches of their murderer protagonists. Phoebe North makes her Strange Horizons debut with a review of Seed Seeker, the conclusion of Pamela Sargent's Seed Trilogy which, Phoebe argues, makes a compelling argument for reading the entire trilogy as the character arc of an AI.